Kalli and Andrew Delaney are opening their Crestline home for the Independent Presbyterian Church Holiday House Tour Dec. 8 and 9. Story by Donna Cornelius • Photos by Lee Walls Jr. The sparkling tree in the stairwell, left, was decorated by Kalli Delaney’s aunt, designer Kris Parsons. 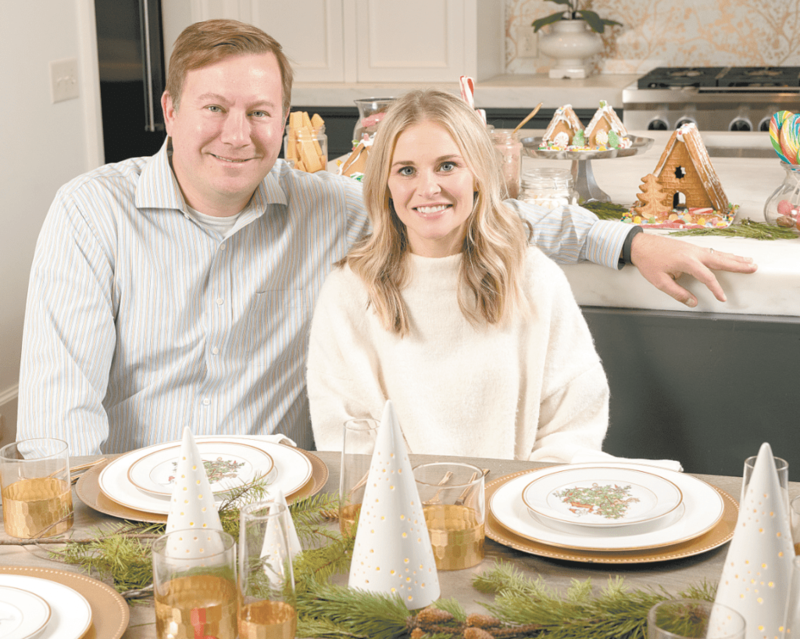 You can’t help catching the holiday spirit at Kalli and Andrew Delaney’s Crestline home. From the candy-filled kitchen island to Christmas trees that range from beautifully appointed to whimsically delightful, this house would make Santa himself feel right at home. Kalli and Andrew have lived in Birmingham since 2004 and moved to 10 Honeysuckle Lane last year after an extensive search. They wanted a house that would accommodate their growing family – and one that didn’t require a lot of work and updating. “With our third child on the way, we didn’t want to take on a remodel,” Kalli said. The couple’s quest came to an end when they saw the Crestline house. Food and floral stylist Christina Brockman filled the kitchen island with gingerbread houses and Christmas treats. Built in the 1950s, the house was purchased in 2005 by Lisa and Matt Costanzo. They completely renovated the house in 2014. Residential designer Matt Costanzo of Matthew V. Costanzo Residential Designs was inspired by the shingle-style houses in the northeast United States. His design took advantage of the lot on which the house sits. Because the lot has an unusual shape with an angled rear property line, the house has a wider front façade than most others in the neighborhood. “I like the way Matt complemented the house’s traditional elements, such as the old millwork that he used,” Kalli said. She said the Costanzos “popped the top” of the house to add more space. The main-level living room is an addition, too. With four bedrooms and a third-floor playroom, there’s plenty of room for the whole family – which includes a lively cocker spaniel named Louie. Although the house was move-in ready, the Delaneys added their own touches with the help of interior designer Catherine Pringle of Catherine Pringle Design. Jessica Schniper, also an interior designer, worked alongside Pringle to get the Delaneys’ house ready for the IPC tour. 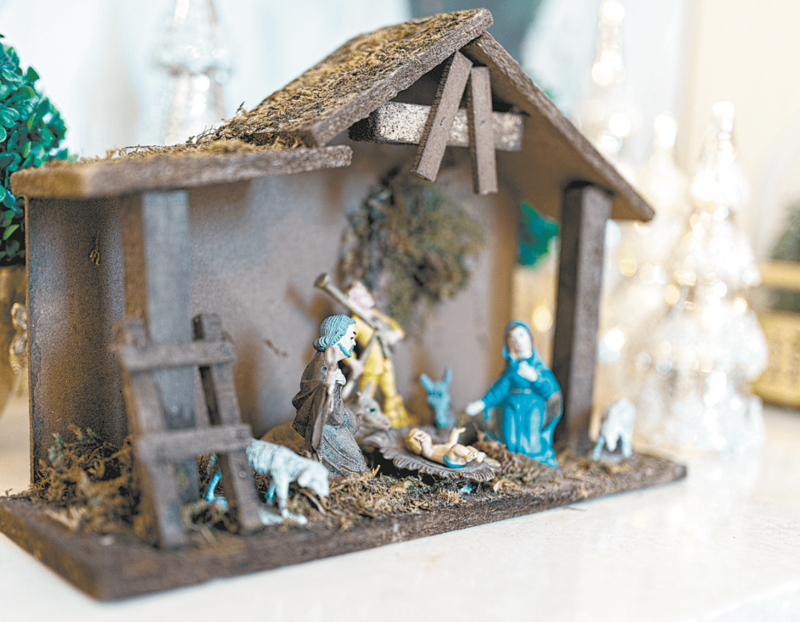 Kalli Delaney said this antique nativity set is just like one her family had while she was growing up in Andalusia. That means that while the house is stylish, there are no rooms where the three Delaney daughters don’t feel comfortable. Mary Charles, age 6, is a first-grader at Crestline Elementary. Betsy is 3, and the youngest Delaney is 18-month-old Cate. During the holiday season, the house is especially merry and bright. The kitchen table is set with festive Fitz and Floyd Christmas china. 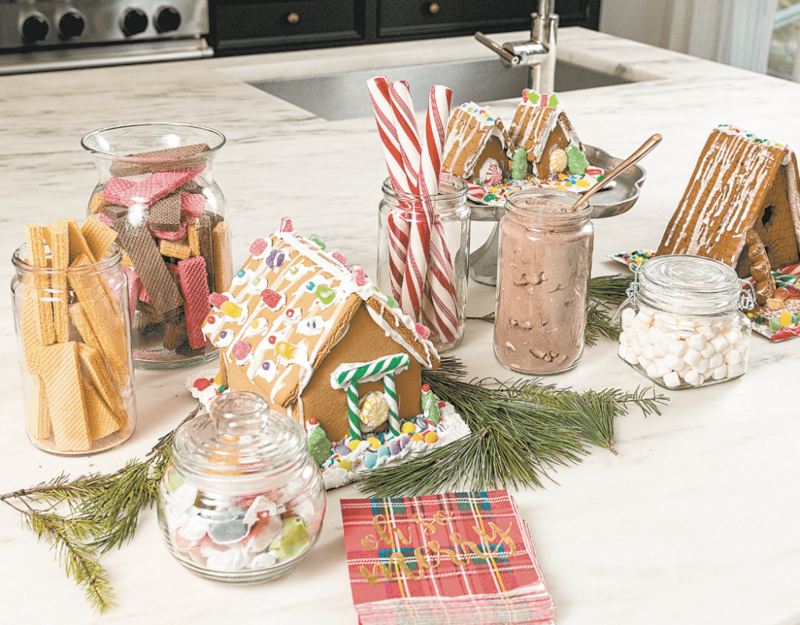 Christina Brockman of Huckleberry Collective has filled the marble-topped kitchen island with an assortment of gingerbread houses, cookies in jars, hot chocolate fixings, peppermints and lollipops. She’s a floral and food stylist who’s also decking the halls with greenery and floral arrangements. In the Delaneys’ living room is a 9-foot fresh tree from Sweet Peas Garden Shop in Homewood. Daughter Betsy chose a princess theme for the tree in the room that she and big sister Mary Charles share. Betsy chose a princess theme for the tree in the room that she and big sister Mary Charles share. It has lots of pink and silver with ornaments shaped like ballerinas, nutcrackers, crowns and hot air balloons. It harmonizes with the room’s pink walls and fun dandelion-shaped pendant light fixture. 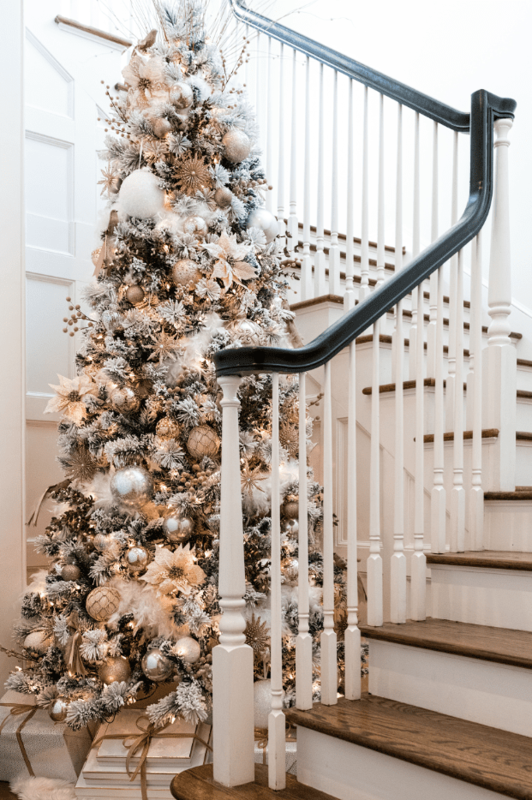 This tree – and another one in the stairwell – are the creations of Kalli’s aunt, designer Kris Parsons. One of Kalli’s favorite Christmas decorations is a nativity set that’s displayed in the living room. Kalli is an Andalusia native and University of Alabama graduate. She’s a busy mom who worked in finance before going back to school to earn a master’s degree in education. Andrew is from Virginia and graduated from Cornell University. After that, he became a U.S. Army Ranger and then got an MBA from the University of Texas. He’s the chief development officer of StateServ Hospicelink, a healthcare technology company. The Delaneys love their neighborhood as well as their house. Kalli said the entire family is happy to be a part of the IPC tour. She said she appreciates the event’s support of ministries such as STAIR – Start the Adventure in Reading. “I love Christmas, and it’s fun to have the girls learning about volunteer work,” Kalli said.